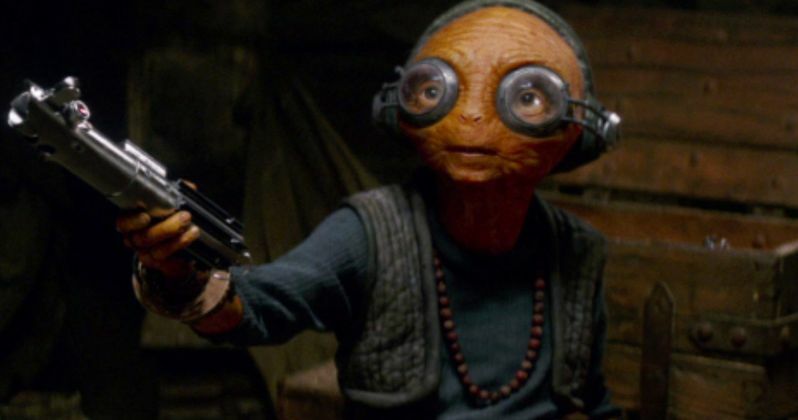 Fear not, Star Wars fans because Maz Kanata will definitely be returning for Star Wars Episode 8. After reports circulated that Lupita Nyong'o hadn't shot scenes in the movie, according to the actress herself, she has indeed shot as Maz Kanata for the follow up to Star Wars: The Force Awakens. That being said, let's try to sort out some of the potential confusion. Lupita Nyong'o recently made an appearance on The Ellen DeGeneres Show in order to promote her new movie Queen of Katwe. During her chat with Ellen DeGeneres, the subject of Star Wars Episode VIII came up. The actress assured us all that she has shot her scenes for the movie and that she doesn't know where the rumor that she hadn't, or that she wasn't going to be in the movie, came from. Here is what she had to say. "I don't know where this rumor came from! I have no idea. It hurt my feelings. I shot my scenes, it's coming out - you never really know, when you shoot your scenes in a movie, which ones are gonna make it and all that. So, it's always, 'Fingers crossed!' But as far as I know, I'm in it." It is interesting that Lupita Nyong'o said she didn't know where the rumor came from, because it came from her own mouth. This is where things get a bit confusing. In a recent interview with Collider from less than two weeks ago, the actress was asked what it was like to work with Rian Johnson, who is, of course, directing Star Wars 8. At the time, she said that she hadn't worked with him yet. Here is exactly what she said. "Rian! I haven't worked with him yet; I've yet to shoot. That's in my future. There is one last bit of evidence we have from a while ago that makes the above quote all the more interesting. About six months ago, director Rian Johnson took to his various social media accounts and posted a picture that showed someone in a motion capture suit, with a couple of pictures of Maz Kanata on some screens. At the time, that seemed to signify Lupita Nyong'o was shooting her scenes for Star Wars 8, given that she did her own motion capture in Star Wars: The Force Awakens. So, let's unpack what might have happened here and what this means. Firstly, it is very clear that Maz Kanata is in the movie and that Lupita Nyong'o has shot her scenes. Now, as for the Collider quote. She was asked if she had worked with Rian Johnson. It is entirely possible that she did her motion capture work with a second unit of some kind and Johnson may not have been on set and that she won't or didn't work with him until she did her voiceover for the character. It is very possible she went in to record her Maz dialogue in the last ten days, and that is what changed in the time between the Collider interview and the Ellen DeGeneres interview. Basically, even though it was a bit confusing, it seems like if you follow the trail there probably weren't any problems and things just got a little muddy and misconstrued. Maz Kanata served as sort of a Yoda-esque character in Star Wars: The Force Awakens and given that Rey will be doing some Jedi training in Star Wars: Episode VIII, it seems essential that the character show up again. So, it is good to hear that Lupita Nyong'o is indeed coming back to reprise the role. Star Wars Episode VIII is currently set to hit theaters on December 15, 2017. You can check out the full Ellen DeGeneres clip for yourself below, as well as the Maz Kanata set picture.